PA chairman welcomes Hamas-initiated "March of the Return" demonstrations. Palestinian Authority (PA) chairman Mahmoud Abbas said on Wednesday that the Palestinian people are facing a "large plot" against their rights and capital, adding that their resistance will not stop in defending the land and the holy sites. In a speech at a conference in Ramallah, Abbas said that Al-Quds (the Arabic name for Jerusalem -ed.) is the eternal capital of “Palestine”, and that the Palestinians’ right to it is based on a history that has lasted more than 5,000 years. "Our ancestors, the Jebusites, built the city of Al-Quds to serve as their capital,” he claimed. Abbas further said that the Arab and Palestinian presence in Al-Quds has never ceased since the Palestinians are "descendants of the Canaanites." In January, Abbas claimed that 5,000 years ago the Levant was inhabited by “Arab Canaanites” – whom he said were the ancestors of today’s Palestinian Arabs. In February, he told the UN Security Council that the Arab residents of Judea, Samaria, and Gaza were in fact descended from the ancient Canaanites. In his remarks on Wednesday, the PA chairman claimed that the land does not belong to the Jews. "Some say land is theirs, but this is not their land." He called for the convening of an international peace conference on the basis of international resolutions, which would establish a multilateral international mechanism that would sponsor future negotiations and the peace process as a whole. 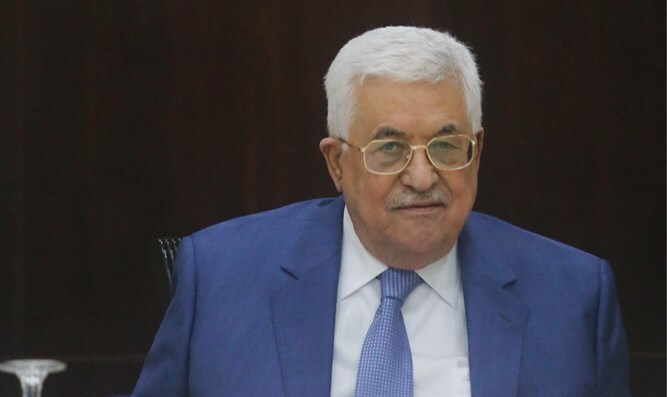 Referring to the position of the U.S. Congress which views the Palestine Liberation Organization (PLO) as a terrorist organization, Abbas said that the PA is acting more than most countries against terrorism, citing as proof the fact that the PA has 83 agreements with 83 countries in the framework of fighting terrorism. "We demand that they prove that we are terrorists even though we are fighting terrorism more than they are," he said. Finally, he welcomed the Hamas-sponsored “March of the Return” to the Gaza-Israel border, claiming that Israel opened fire with the intention of killing the demonstrators. "Hamas has begun to adopt popular resistance by peaceful means, and I congratulate them for agreeing that popular resistance by peaceful means is more effective," said Abbas.